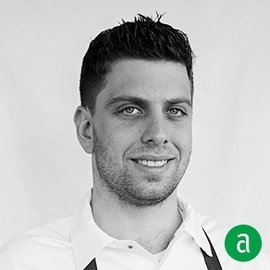 Yehuda Sichel, Executive Chef of Abe Fisher in Philadelphia, shares his career timeline and advice for up-and-coming talent. Steve Cook has always instilled in me the notion that above all else, it’s all about the guest. I find that the back-of-house sometimes needs to take a step back in order to keep the guest top-of-mind, while preparing the menu. I knew when I was 15 years old that I belonged in this industry. I worked at a restaurant that was split between two concepts: a deli side and a fine dining kitchen. I started as a Deli Cook, but during lunch service, I found that I loved working the grill in the fine dining kitchen of the restaurant. It was then that I realized I was doing something fulfilling and endlessly exciting. It also turned out that I was becoming good at the job, and over time, I was promoted from the deli side to the fine dining kitchen. That was huge for me; I think that was the defining moment. I keep my team inspired by consistently talking about the bigger picture. I make it a point to remind them, especially during busy shifts, that there is a dining room full of our guests, excited to taste the dishes they are cooking. I look for cooks that are able to take constructive criticism. For me, the best way to educate myself is by consistently challenging myself to change the menu. It’s important to do my research and I'm always thinking about the most interesting seasonal ingredients that are available to us. I also explore different sub-cultures of Jewish cuisine to find inspiration for new dishes. My favorite cookbooks are: "East of Paris" by David Bouley, who explores Austrian cuisine with modern techniques. "The dishes of "Zahav: A World of Israeli Cooking" built the foundation of my career in food and,lastly Georges Perrier's, "Le Bec-fin Recipes" is staple cookbook on classic French technique. I remind my team that if they work hard and work smart, there’s a lot of room for growth, and being a goal oriented cook is important. I think it's very important to show your staff that you are there to support them, so you'll often find me right by their side, behind the line, working service with them. There is no job too small for me!